Aurelia invites members of the Webster community to a Hometown Preview Concert on Thursday, Jan. 17. 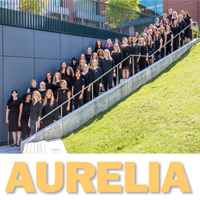 Aurelia, formerly known as the Webster University Women’s Chorus, is one of this year’s collegiate choirs invited to perform at the annual Missouri Music Educators Association (MMEA) In-Service Workshop/Conference. The MMEA conference convenes later this month in Osage Beach, Missouri. Aurelia’s repertoire celebrates a diverse array of pieces composed for treble voices, with a special emphasis on uplifting the work of living composers who are women. “For every composer whose works have passed comfortably into the public domain, there’s a living artisan weaving grants and commissions and royalties and teaching and performing together into the tapestry of a composer’s career," said Stuart Chapman Hill, director of Music Education and Aurelia’s conductor. "It is at this intersection that we find the five pieces on this program, and the five living women who composed them." Aurelia presents a Hometown Preview Concert at 7 p.m. on Thursday, Jan. 17, at the Webster Hills United Methodist Church in Webster Groves. Admission is free.